Home Aadhaar Card Career World Government Jobs Aadhaar Card (UIDAI) Me Nikali Hai Jobs, Kaise Kare Online Apply. Aadhar Card Jari Karne Ki संस्‍था UIDAI (Unique Identification Authority) Me Aapke Liye Job Ka Mauka Hai. UIDAI Ne Senior Se Lekar Junior Post Tak Ki Kai Vacancy Nikal Kar Logo Se Application Form Bharne Ke Liye Kaha Hai. 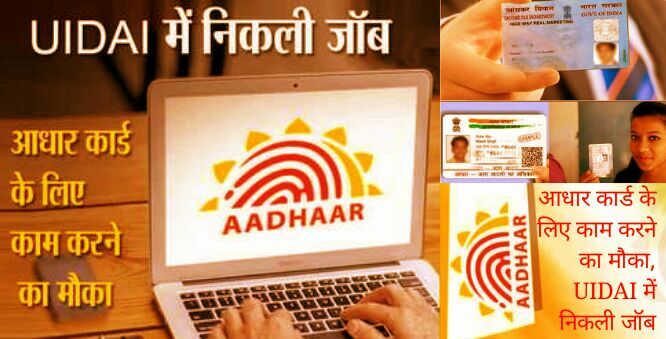 UIDAI Ki Aur Se Technical Officer, Private Secretary, Assistant Section Officer Aur Stenographer Ki Jarurat Hai. Agar Aap Bhi In Posts Ke Liye Interested Hai, To Apni Eligibility Check Karke Apply Kar Sakte Hai. Aap India Ke Kisi Bhi Hisse Me Rahte Hai To Bhi In Post Ke Liye Apply Kar Sakte Hai. Ye Vacancy Country Ke Alag Alag Cities Me Hai. ➧Kon See Cities Me Vacancy Hai. Hyderabad, New Delhi, Manesar, Guwahati, Bangalore, Ranchi, Chandigarh and Mumbai. ➧Kis Posts Ke Liye Kar Sakte Hai Apply. 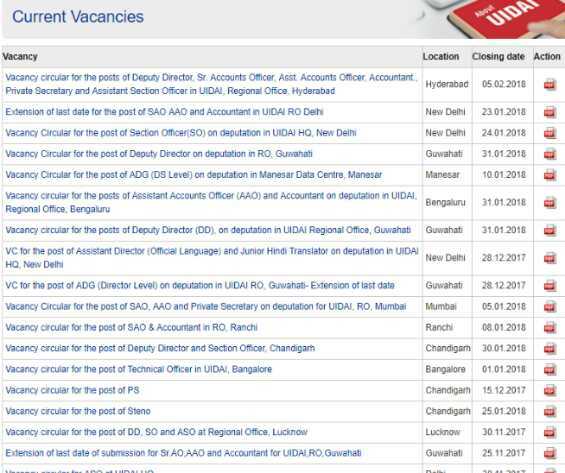 UIDAI Ne Jin Posts Ke Liye Vacancy Nikali Hai Usme Deputy Director, Senior Account Officer, Accountant, Private Secretary, Assistant Section Officer Shamil Hai. ➧Aadhar Card Job Ke Liye Kaise Kare Apply. Vacancy Se Judi Jyada Jankari Ke Liye Aap UIDAI Ki Website https://uidai.gov.in/ Par Jaaye. Yaha Aap About UIDAI Par Click Kare. Uske Baad Aapko Right to Information ke Niche Current Vacancies Ka Option Milega. Is Par Click Karne Ke Baad Aapko Har Vacancy Ka Notification Mil Jayega. Yaha Par Aap Kisi Bhi Vacancy Ke Form Download Kar Sakte Hai Iske Liye PDF File Download Kare. ➧Apply Karne Ki Last Date Kya Hai. Filhaal Agar Aap In Vacancy Ke Liye Apply Karna Chahte Hai To Aap 25 January 2018 Se Lekar 5 February Tak Apply Kar Sakte Hai. Har Vacancy Ke Liye Apply Karne Ki Last Date Alag Alag Hai. Alag Alag Vacancies Ke Liye Eligibility Alag Alag Hai. Yaha Simple Graduate Se Lekar BST Aur Diploma Holders Ke Liye Bhi Job Hai. Kuchh Vacancy Deputation Ke Aadhar Par Bhari Jayegi. Agar Aap Kisi Central Government Ki Naukri Me Hai To Bhi In Posts Ke Liye Apply Kar Sakte Hai. ➽Ye 5 Important Documents Har Indian Ke Pass Hona Jaruri Hai. For mobile registration visit any Aadhaar centre in your area with Aadhaar card and proof of change (address proof) and mobile phone with the number which you want to register. aadhar card print which needs to be shown to avail of certain services, such as opening a bank account or applying for a government scheme.